So, you’re planning an event in Jerusalem… Congratulations! Whether you’re celebrating a special occasion like a bar/bat mitzvah, a birthday, an anniversary, engagement or just looking to have a special night out with a group of family and friends, Jerusalem is full of unique venues that are more than happy to accommodate. To help you choose the ideal place to celebrate, we’ve taken the liberty of finding the best venues for various types of celebrations. Bar/bat mitzvahs, weddings, corporate events and other events that have the potential for an expansive guest list require a dedicated event venue with facilities and service that will ensure that the event goes off without a hitch. Boasting one of the most iconic views of Jerusalem, Olmaya promises an unforgettable experience. Located on the Haas Promenade, Olmaya is one of the go-to venues for anyone looking to add a luxurious touch to any event, including weddings, bar/bat mitzvahs, corporate events and brit milah’s, with first-rate facilities and a standard in service at international levels. Olmaya’s gorgeous event space features a spacious garden and a sleek transparent glass structure with a retractable roof that makes it ideal for all seasons and weather maximizing the picture perfect panoramic views from every angle. The “Inside Arches” space allows a different setting with warm wood and Jerusalem stone accents, perfect for a cocktail reception or dynamic after party. Thei in-house caterers answer to all tastes and styles with variety of exquisite menu options and the Olmaya exclusive custom bar menu satisfies all guests. Olmaya can be tailored to all events, ranging from intimate tefillah and brunch ceremonies of 100 to summer weddings of 600. Kibbutz Ramat Rachel is one of the most picturesque venues in the city, surrounded by green grass, orchards and forest with a gorgeous hilltop view of the valley below. There are several event halls to fit any size event from 50 to 900 people. The Masik Banquet Garden allows you to hold an indoor/outdoor event with either table service or self-service buffet style catering. The location on the outskirts of the city offers a serene atmosphere, but the kibbutz is still only a short drive or bus ride from the city center. Out of town guests who want to be close to the action can also stay at the 165-room Ramat Rachel Hotel, and the venue has a dedicated staff that can guide you through the event planning process. 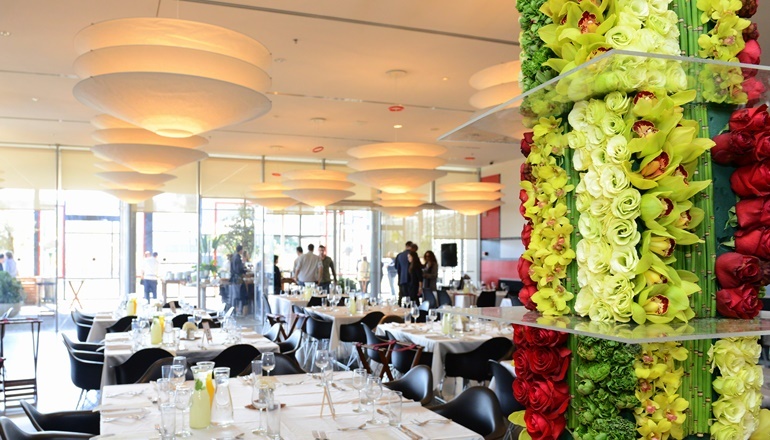 Israel Museum is not only one of Jerusalem’s leading attractions but it is also home to one of the best restaurants in the world of private celebrations, including bar-mitzvah events. That is, of course, Modern Restaurant. The place has a large space that can accommodate up to 400 guests and it is perfect for bar/bat mitzvah celebrations. If you’re planning a larger event, you can also expand into the museum area. In addition, as part of the amenities that are offered by Modern Restaurant, you’ll find projection equipment, a screen, and a sound system. As for the food, hosts can choose from 12 different event menus, which were personally designed by Chef Oren Yerushalmi, and which guarantee the perfect bar-mitzvah meal. Alongside the historic biblical story, the Bible Lands Museum offers 6 venues of different sizes that would comfortably fit a bar/bat mitzvah event of any size or budget. The museum offers an exclusive experience that features an historic value in the event program, using interactive tours for children and adults in a variety of themes: stories of the Bible, Jewish holidays, and more. An extraordinary experience for those who are celebrating a bar/bat mitzvah! Make sure to check out the classic and luxurious event venue or the “Seven Species” garden – the perfect option for outdoor events that combine fascinating content and a unique atmosphere. For location and ambiance, it’s hard to beat Touro Restaurant in the historical Mishkenot Shaananim neighborhood. Nestled in the Jerusalem Press Club building, Touro boasts a stunning view of the Old City walls and an impressive culinary selection of Mediterranean favorites combined with Asian influences put together by esteemed chef Benny Ashkenazi. Touro is a favorite among Jerusalem’s best event planners for bar/bat mitzvahs and other events. With eight venues around the country specializing in private events, conferences and live music concerts, the Zappa knows exactly how to ensure your event will run smoothly and be a complete success. From the moment you enter the Zappa club in Jerusalem, you will immediately notice the romantic atmosphere that surrounds this stylish venue with its chic black leather stools and a stunning professional stage. If you’re planning a medium sized event, the Zappa can accommodate up to 350 guests. However, they also have many options for intimate events, including a Dinner & a Show concept, small scale birthdays, wedding proposals, or even a company night out. Add the chef’s high end kosher dining experience and a live music show to your event, and you’re all set! If you’re looking for an elegant restaurant venue with a unique culinary offering, La Boca is a prime choice in downtown Jerusalem for small-to-medium-sized events. The space is specially designed to host events, with a ground floor that holds up to 90 people, a second floor with a capacity of 120 (which can be divided for smaller events) and a private VIP room for extra-intimate affairs. Chef Guy Kimchi offers various special menus based on Latin American cuisine with a Mediterranean twist alongside an extensive selection of boutique Israeli wines from the in-house wine cellar. Yad Ben Zvi’s event complex is the perfect solution for those who wish to host a corporate event for a large group of employees. The environment is unique and filled with culture, content, and added value. The complex is located at the official residence of Israel’s second president – Yitzchak Ben Zvi. Planning an event at Yad Ben Zvi is easy and simple. The event planners go through all the details with the host, making sure that you get the best company gathering experience. The staff takes care of everything, including: sound systems, seating arrangements, projectors, kosher catering, and even copy and print services. The reception gallery can accommodate 120 guests. Following the reception, you can choose to continue to a banquet hall designed for 60-100 guests and includes a projector and a sound system. You could also choose to host a larger event at Yad Ben Zvi’s auditorium that can seat up to 300 people. Located in the charming First Station compound, Lechem V’Basar is a modern restaurant with a casual atmosphere that specializes in high-quality meat alongside fresh bread and salads. In addition to a delectable menu, it has a private event room that can host up to 30 people, and if you book the entire restaurant, you can have up to 120 guests in the winter and 150 in the summer. The decor is an eclectic mix of retro furniture, which makes for a lively atmosphere, perfect for casual celebrations and group dinners for family, friends or work colleagues. Menu prices range from 120 to 200 NIS per person. With an amazing location in a historical building in the Nahalat Shiva neighborhood of downtown Jerusalem, Piccolino has become one of the most sought after event venues in the city. In addition to the prime reals estate, Piccolino can host both indoor and outdoor events, offers a rich dairy Italian menu and even live music for your event (every day from 12:00-2:00 pm and 8:00-10:00 pm). Piccolino can hold 170-210 people total (depending on the season), including 90 people indoors (in 3 separate rooms) and 80-120 people outdoors. For smaller events, the 3 indoor rooms are bookable separately, with capacities ranging from 15 to 35. Just across the way from Piccolino, Kinor Bakikar is an ideal place to host an event with a high-end kosher meat menu. The indoor dining room has a luxurious, steakhouse-style motif, and, of course, you have the picturesque outdoor courtyard surrounded by beautiful Jerusalem architecture, white Jerusalem stone, a performance stage with daily shows and even an elegant fountain. The atmosphere simply can’t be beat. The food is naturally nothing short of excellent with veteran chef Chef Kobi Katani’s blend of classical European and modern cuisine with a touch of local flavors. If a ceremony at the Western Wall or anyplace in the Old City is part of your celebration plans, you’ll be hard-pressed to find a more convenient and beautiful venue than Between the Arches. In addition to its location in a beautiful 13th century building just a few steps away from the Western Wall, Between the arches is one of the best kosher fish and dairy restaurants in town, serving a collection of original dishes concocted by Chef Shai Lotiti. Between the Arches has a total capacity of 90 people, but if you’re event is smaller, then you can book the upper floor for an event of up to 30 people. Located across the street from the First Station compound where the Baka neighborhood meets the city center and Old City, the Khan Theater is not only incredibly convenient and central, but also beautiful facilities housed in a renovated 19th century Ottoman building characterized by typical Jerusalem stone and a romantic, festive ambiance, including 2 indoor event rooms and a spacious courtyard. The picturesque courtyard can be booked on days when there are no other events at the theater and holds up to 300 people. The trees and ancient millstones make for beautiful surroundings and the perfect venue for a summer event. During the summer, the theater is on break, and Friday afternoon. You can also hold events for up to 100 people on the balcony overlooking the courtyard or up to 60 people in the Khan Cafe. The theater’s catering offers a rich menu selection ranging in price from 170 to 400 NIS per person. If you don’t need a large space, Jerusalem is full of unique and charming restaurants, cafes and other venues that offer the option of booking a private room or renting out the entire establishment, depending on the size of your event. 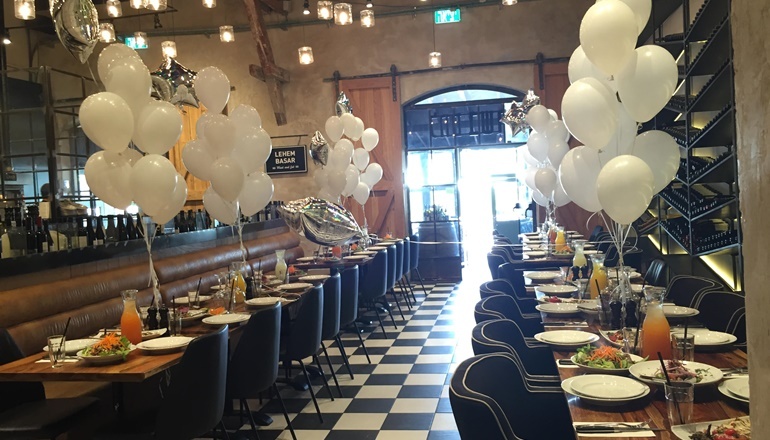 These venues are perfect for group dinners with family, friends or colleagues, as well as small to mid-size celebrations like brit milahs and birthdays. 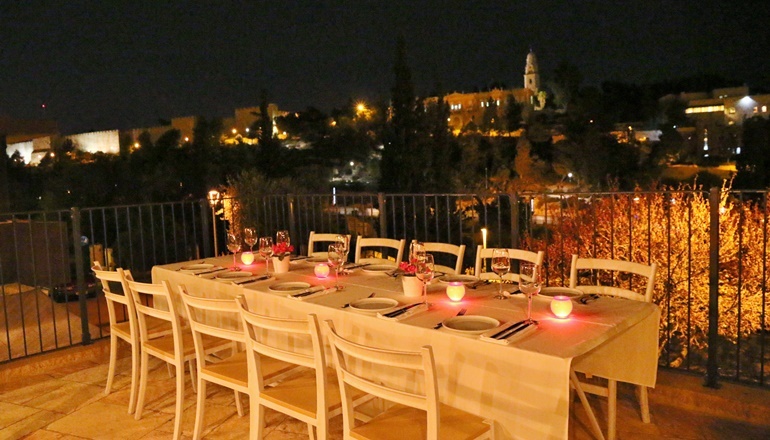 Located at the heart of the Judaean Mountains, right at the entrance to the picturesque town of Nes Harim is Pichonka restaurant. Pichonka is a rural restaurant situated on a mountainside and overlooking the stunning vistas of nearby mountains, forests, and rivers. The atmosphere is pictorial and carefree, and therefore, ideal for birthday and milestone events. The restaurant has a diverse event menu that includes salads, focaccias, meats, fish, gourmet courses, a children’s menu, a selection of soft drinks and high-quality hard alcohol. In addition, the restaurant offers special event menus for large groups according to customer’s requirements. 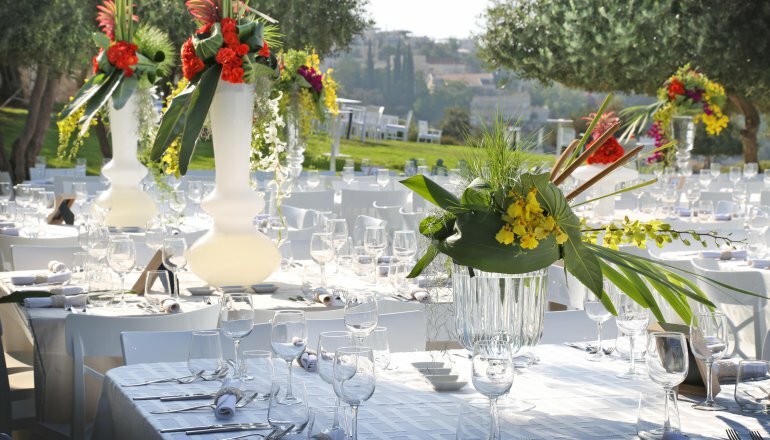 With a location right on the lake in the Jerusalem Botanical Gardens, this branch of Cafit gives you the chance to take advantage of one of the most picturesque corners of Jerusalem for your event. You and your guests will have a fantastic view of the area and intimate atmosphere, surrounded by beautiful and exotic flowers and trees from all over the world. Cafit has become one of the most popular chains in the city and offers a rich dairy menu with salads, pasta, fish sandwiches and more that will perfectly complement any occasion. The menu for afternoon and evening events ranges from 110 to 145 NIS per person, and breakfast events cost 75-125 NIS per person. Didn’t find what you’re looking for in this article?